Music, sports and culture events are just some of the fun that awaits visitors to Mexico’s Pacific Treasure. This month’s highlights include the RHA Festival the 2017 AMS and the 2017 Corona Sunsets. Summer is ready to roll in the Riviera Nayarit! In addition to our sun, sand and luxury offerings there are all kinds of fun events going on this July that bring the destination to life and promote throughout in Mexico and around the world. Music, sports and culture events are just some of the great activities awaiting visitors to Mexico’s Pacific Treasure, and they not only attract thousands of tourists but also generate important revenue for the micro destinations where they take place. It all started June 30 through July 1st with the RHA Festival at the Marina Riviera Nayarit in La Cruz de Huanacaxtle with the participation of the top names in house music, an electronic genre influenced by soul and funk. Neither the sun nor the rain was a setback to the more than four thousand people who came to enjoy this incredible musical experience. On Friday the 30th the waves broke to the beat of Deepersoul, Zen Freeman, Julian Sanza, Marques Wyatt, Doc Martin, Purple Disco Machine and Cat´z N Dogz, and by midnight things took a mystical turn with the arrival of Claptone and thousands of people dancing to his rhythms. On Saturday July 1st everything was up and ready for the second half of the party featuring Sonosfera, Jay Tripwire, Halo, Silver City, Dimitri From Paris, Sandy Rivera, Walker and Royce, Teenage Mutants and Sandy Rivera, ending with Green Velvet, who took control after intense fireworks to bid adieu to this first edition of the RHA Festival. The traditional village of San Pancho was on everybody’s mind from July 21-23 during the NIIJIMA Riviera Nayarit Mexican Surf Open, which had $100 thousand pesos in cash and prizes and attracted the top surfers in Mexico and abroad, both professional and amateur. But that’s not all: while the competition was going on there were shows on stage including Casimiro Zamudio’s Mi Banda El Mexicano as headliners, plus Rubén Albarrán DJ Set (Café Tacvba), Los Vikingos del Norte, Los Minions, DJ Bola Pirata and DJ Funky Kong, among others. Approximately 2,500 people attended this music/sports event that also took the opportunity to get to know the traditional village of San Pancho, the Cultural Capital of the Riviera Nayarit. Women’s Open Category: 1st place: Leila Takeda de Oaxaca / 1st place: Regina Pioli / 3rd place: Rain Bush / 4th place: Kristal Hernández. Men’s Open Category: 1st place: Julio Quiñones, de Colima / 2nd place: Dylan Southworth / 3rd place: Kevin Rodríguez / 4th place: Diego Cadena. City Boys: 1st place: Brian Sandoval, de Sayulita / 2nd place: Yoali Ramírez / 3rd place: Adrián Vanin / 4th place: Elías Castañeda. 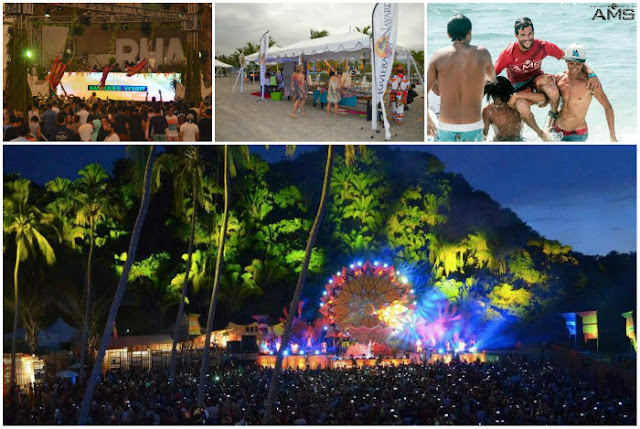 On Saturday, July 22 San Pancho was once again the place to be for one of the most spectacular events in the past few months: the 2017 Corona Sunsets “The Call of Summer,” which had over 6 thousand people out on the beach at Hacienda San Pancho. The combination of ocean and music was perfect for celebrating the sunset and presenting the best of the best of electronic music. The Entre Amigos Community Center also had top billing, as did the Huichol handicrafts and environmental awareness with the sustainable Eco Challenge program, which focuses on getting people to understand how important it is to conserve our ecosystems, especially the ocean, and to stop throwing out trash and plastics. Every year, the Riviera Nayarit Convention and Visitors Bureau (CVB) and its Groups and Events desk lends its support to more than 80 events of all kinds. These actions help to spur a measurable increase in the influx of visitors, which benefits the entire tourism service platform within the region.